The Autism Society Philippines was invited to the Third Country Training Program (TCTP), a Capability Building of Persons with Autism and their Parents in Bangkok, Thailand. 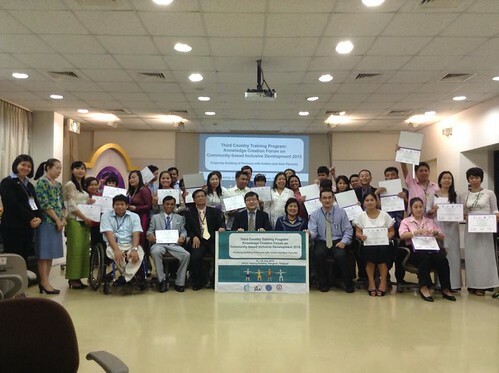 This training program is the outcome of the joint project of the Asia-Pacific Development Center on Disability (APCD) and the Japan International Collaboration Agency (JICA). The TCTP is conducted by the Government of Japan and The Government of Thailand, together with APCD and the Ministry of Foreign Affairs of Thailand through the Thailand International Cooperation Agency (TICA) and JICA with support from the Ministry of Social Development and Human Security of Thailand (MSDHS). The training’s expected outcome is for the young leaders and their parents to gain information and knowledge on disability and development in the CBID context and on the creation, exchanging and elaboration of recreation, leisure and sports for future implementation. The ASP sent Ms. Marivic R. Ramos, an ASP Board of Trustee was joined by Raichan Dearoz , a young adult with autism from the Municipality of Carmona, Cavite. The Philippine participants arrived in Thailand at July 12, 2015. There were six (6) countries participated in the event namely; Thailand, Vietnam, Cambodia, Myanmar, Laos and the Philippines which adds up to twenty four (24) participants in total. The training started the next day with a welcome program. Executives of the mentioned agencies were present Mr. Akiie Ninomiya , the Executive Director of APCD gave the welcome remarks. The first to give the opening remarks was Ms. Paiwan Phonwan, the Deputy Director General of the Department of Empowerment of Persons with Disabilities. Mr.Yasumitsu Kinoshita, the Senior Representative of JICA, Thailand Office and Mr. Wattanawit Gajaseni, the Director of Countries Partnership Branch (Bilateral and Trilateral) TICA gave their opening remarks consecutively. The succeeding days were concentrated on the Recreation, Leisure and Sport training, conducted by the resource persons from Japan and Thailand. The country participants were toured to the Thai Autism Vocational Center, run by The Association of Parents of Persons with Autism (AU-Thai), where they showcased their programs for persons with autism and to the Bangkok Youth Center (Thai-Japan) a sports complex where the children go to have a swimming lessons. The participants also had their turn the next day for some swimming lessons and a time for an open forum. The last three (3) days of the training was focused on the consensus of the 6 countries on what activities to promote on the upcoming 3rd ASEAN Autism Network Congress in the Philippines. Each country was also asked to develop an action plan on recreation, leisure and sports to exercise and apply their first hand knowledge to their home country. Ms. Marivic Ramos was instructed to make a plan of action for the upcoming AAN 3rd Congress. The country report was successfully delivered through a virtual presentation by Ms. Mona Magno-Veluz. On 24 July 2015 the participants got their certificates of completion of the training. The training was refreshing after realizing that simple games such as bird relay can be very fun if played by the persons with autism and their parents. Most of the times we tend to seek more complicated activities for our children which leave us to be looking for things that we don’t have, and not realizing that we become more critical because of our increased expectations on them, when our only objective is for them to have a physical activity, fun on their free time. The experience in Thailand was not only about acquiring of the technical knowledge of the recreation, leisure and sports, but a realization of many things like our country, being way ahead in terms of the autism advocacy from some of its neighboring countries. I was approached many times by the parent participants for inquiries, clarifications and comparing notes on our experiences in our advocacy. The Philippines has the social responsibility to give assistance in terms of sharing of knowledge, and moral support to other parent associations of other countries through the oldest and biggest Autism advocacy group, the Autism Society Philippines. About the contributor: M. Victoria Ramos currently serves as the an ASP National Trustee. Marivic is a pillar of the autism advocacy community in Los Baños, immersing herself in special education and training and empowerment programs over the years. As an ASP delegate, she was elected to the board of the Philippine Community Based Disability Inclusive Development Network. She is a single mother to a young adult with autism, Victor Michael "Mico" Ramos.